That explains the bloodstains on the letter … and I thought it was ink. Strange Brew by John Deering. Throughout the year, I get questions and comments from Arkansas Democrat-Gazette readers that I can’t always address right away. For this week’s column, I’ll take on a few. No charge for additional snark. 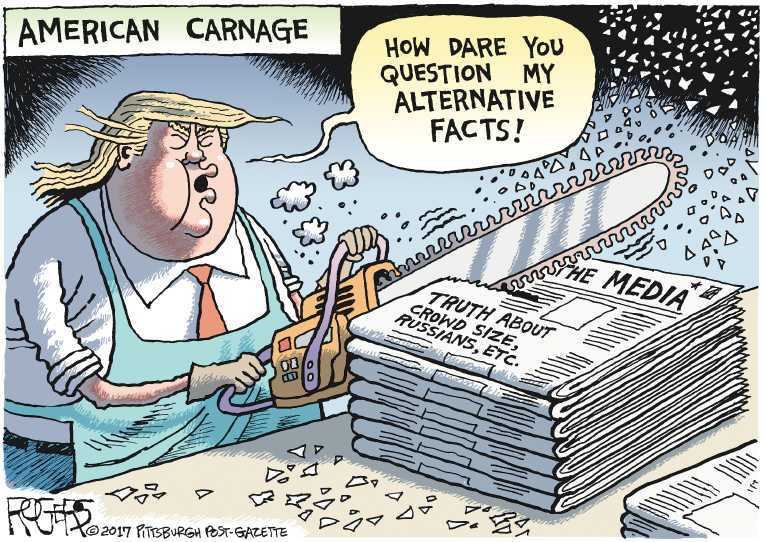 🍊 Why are so many of the editorial cartoons printed on the Voices and editorial pages critical of the president? Well, that’s kinda what political cartoonists do. They take a current issue and, often using hyperbole and satire (but not always), put their spin on it. Doing that coherently in a small space takes a lot of talent and intelligence … and pretty thick skin to withstand abuse from those who disagree with them (even more vociferously lately, it sometimes seems). There are many reasons I admire John Deering (and other cartoonists), such as his wide-ranging talent (cartoons, paintings, sculpture, etc. ), sense of humor, whimsy, derp sessions and hilarious texts, but his polite reaction to his critics is something I aspire to. Others could learn a lot from him. Sure, he may gripe a little with friends, but not to the face of the source of his irritation. This is one of the very first editorial cartoons I remember seeing, and it was in a history book. Editorial cartoon by Thomas Nast found on Museum of the City of New York. Herblock cartoon found on Library of Congress. Every president faces criticism in cartoons, editorials, columns, and from fellow officials and the public—that’s part of the job and always has been. 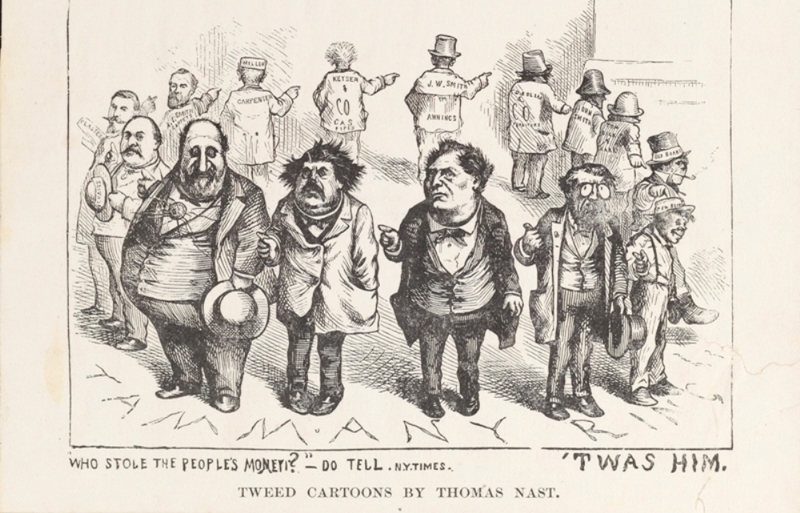 Thomas Nast—probably most famous as the creator of the modern Santa Claus, but also credited with helping take down Boss Tweed’s Tammany Hall machine with his cartoons—and Herblock, who skewered presidents on both sides of the aisle and coined the word “McCarthyism,” would have a field day with our current president. Current cartoonists like Clay Jones, David Horsey, Ann Telnaes and Rob Rogers (and my buddy John) are certainly having fun with it. It’s just so unfair to tell people the truth!!! Editorial cartoon by Rob Rogers, Pittsburgh Post-Gazette (pre-firing). 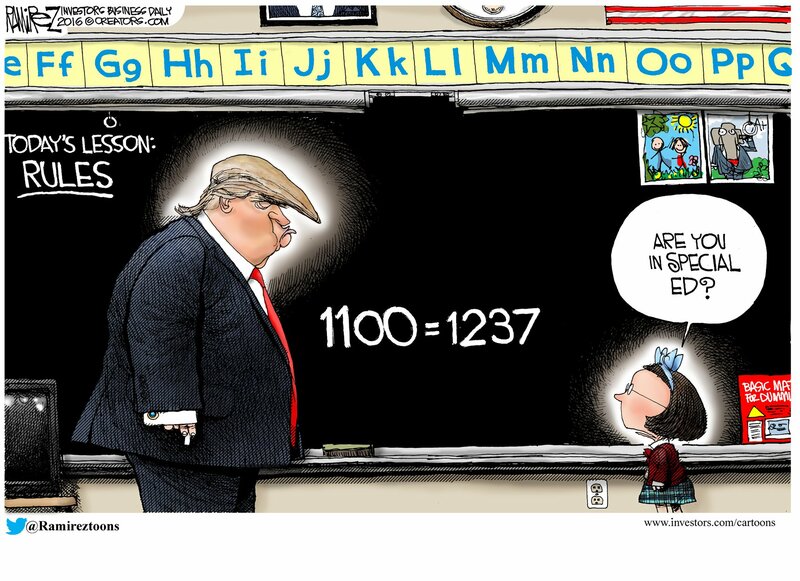 Another reason is that it’s actually hard to find noncritical cartoons on this particular president, even from reliably conservative cartoonists like Michael Ramirez (who is extremely conservative) and Lisa Benson, and that’s a problem that’s not unique to the Democrat-Gazette. Sure, there are a few cartoonists out there (Ben Garrison, most notably) who lavish nothing but praise on the president (often creepily so), but they aren’t included in our syndication contracts (and need I remind you, it is not the job of the media to tote water for any official). 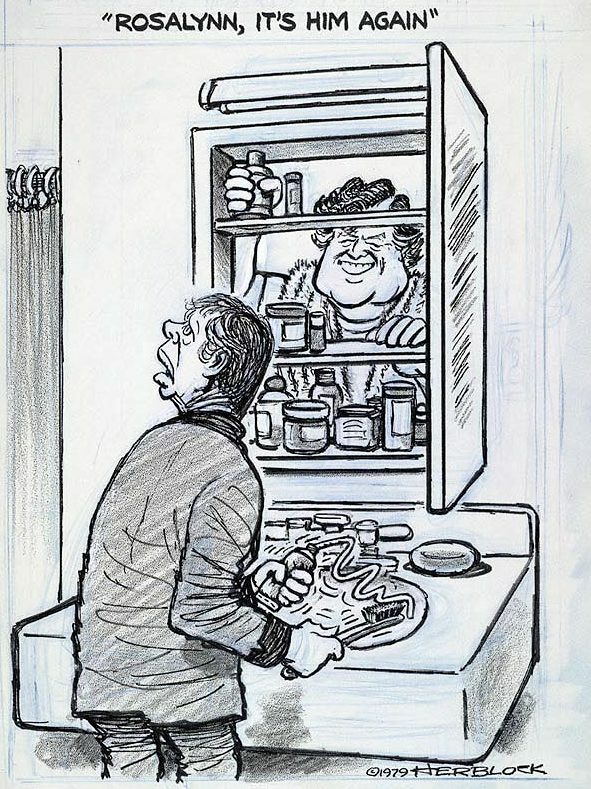 Out of the contracted cartoonists, we publish only a small percentage of their cartoons, discarding some for being too harsh, too “inside baseball,” or just too out there to understand. Ramirez is probably the most conservative cartoonist we use … and he seems to find it hard to do a positive cartoon on Trump too. Editorial cartoon by Michael Ramirez, Investor’s Business Daily. I admit I have a soft spot for the “out there” cartoons. Laughing at the absurd is much less stressful than crying. 🤬 Why won’t you print my letters, you [expletive]? I think you just answered yourself there, friend—threats, bullying and name-calling will get you nowhere. That and you probably: threatened another letter writer or called him an idiot; stated something as fact that isn’t (allowances are made for obvious satire); don’t actually exist; sent something far too long to be printed (aim for no longer than 300 words); just had a letter printed (yep, I’ve got one guy who constantly complains—exceedingly rudely—that he never gets printed, yet has a letter in most every month); wrote something wildly inappropriate for a family newspaper, etc. Then there are the people who never reply to requests for publication. But keep thinking I’m evil. Well, I am, kinda, but it’s the fun kind, not the hellfire kind. Got a prank to pull or the need to chortle uncontrollably? I’m your girl. 👿 Speaking of evil, why are you so anti-Christian, pro-abortion and never-Trump? Uhhhh … I’m a Christian and have been since I was 12. No one’s letters are discarded because of their religious inclination, but if those letters are essentially lists of Bible verses or contain inflammatory/incorrect information, they will be. The Voices page is not Bible (or Koran, or Torah, etc.) study, but there are still an awful lot of religious letters printed. Apparently some people want to go back to this … maybe wire-hanger manufacturers? 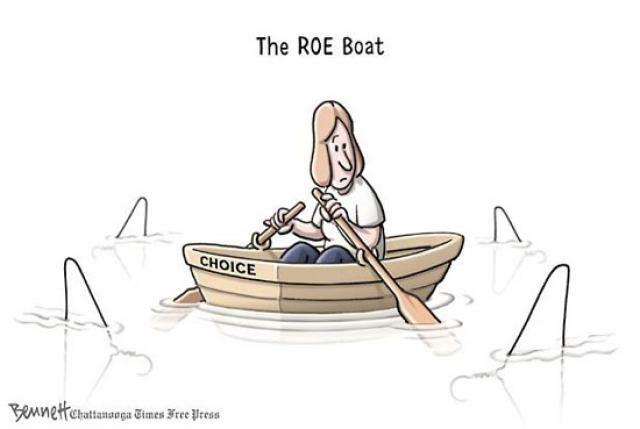 Editorial cartoon by Clay Bennett, Chattanooga Times-Free Press. I’m not pro-abortion, but pro-choice (yes, there is most definitely a difference). While I personally would not have an abortion unless absolutely necessary, I can’t in good conscience make that choice for other people through government decree (that would be the libertarian in me). I know people who’ve had to have an abortion (nearly all for medical reasons, as in the mother and/or the baby wouldn’t survive), and it was not a decision taken lightly. If someone makes that choice, I would much rather it be legal (and rare … and it is becoming rarer), safe, and done by medical professionals than to hear stories of tragic back-alley abortions. My mom’s generation had enough of that. How dare reporters ask him questions and actually expect answers rather than insults and lies??!!! 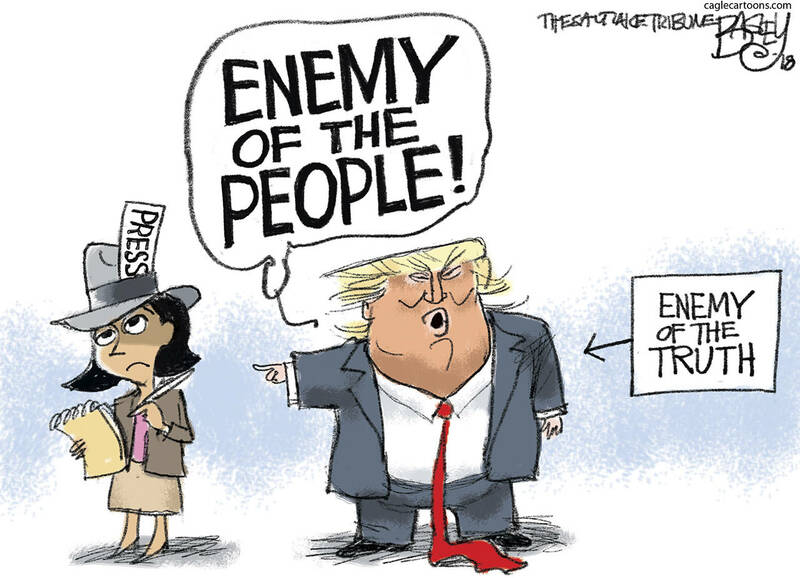 Editorial cartoon by Pat Bagley, Salt Lake Tribune. As for the president, I can only judge him on his actions, and I admit I’m not a fan, especially when he continually attacks members of my profession for simply doing their jobs. However, my personal feelings here don’t matter. I’m more than happy to print letters from Trump supporters but, just like everyone else, they have to follow the rules and can’t state falsities as fact without attributing them to the source, and should respond when asked if we can publish the letter. I’m not a mind-reader. 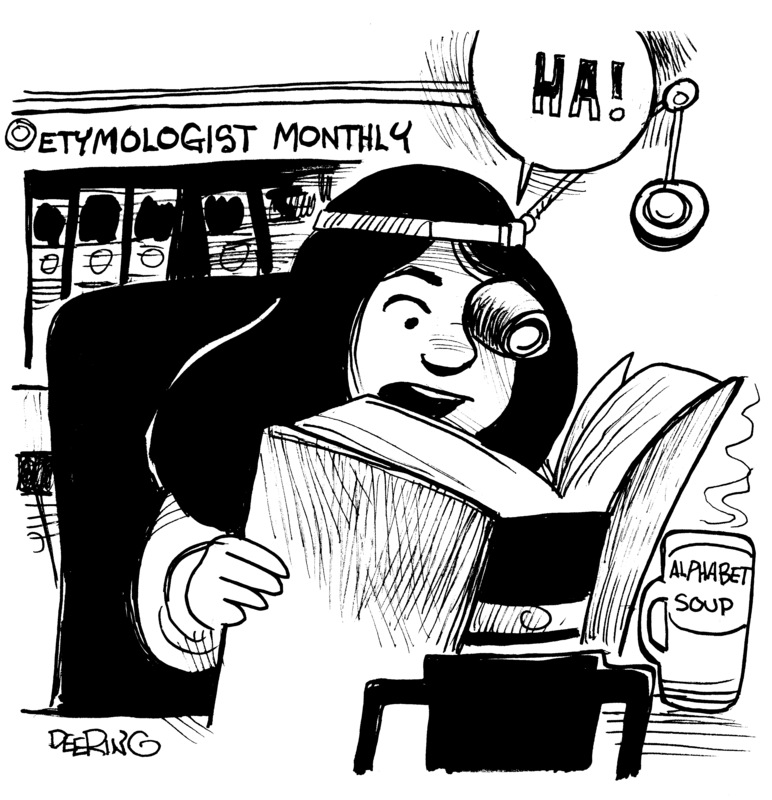 Get a load of the size of the Etymology Monthly! I cannot change who I am: a word nerd. There are enough fellow nerds out there who want me to talk more about words, so objection overruled. For those people, I have my own request. As I mentioned last week, Lake Superior State University will, sometime around New Year’s, release its latest list of words and phrases recommended for banishment. What (not who … no people, please) would you like to see go away? Let me know in the comments, or send me an email at blooper@arkansasonline.com, and you may show up in a future column. I know. It will be hard to contain the excitement.